신희건,(2019).일 지역 보건의료계열 대학생의 정서지능, 삶의 질, 학과적응이 학과만족도에 미치는 영향.한국데이터정보과학회지,30(2),299-308. 본 연구는 일 지역 보건의료계열 대학생의 정서지능, 삶의 질 학과적응 및 학과만족도 간의 관계를 알아보고, 대학생의 학과만족도에 영향을 미치는 요인들을 파악하기 위해 시도된 서술적 상관관계 연구이다. 2016년 10월 24일부터 26일까지 A대학교의 보건의료 계열 6개 학과에 재학 중인 1~4학년 학생 201명을 조사대상으로 하였다. 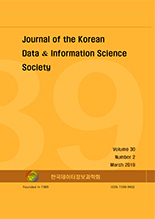 연구결과 대상자의 정서지능은 197.74점 (0~400점), 삶의 질 6.49(0~10점), 학과적응 6.55점 (0~10점), 학과만족도 6.39점 (0~10점)이었다. 일반적인 특성에 따른 정서지능은 유의한 차이가 없으며, 대학생의 삶의 질 학과적응, 학과만족도는 전공, 학교 성적, 친한 친구 수에 따라 유의한 차이가 있었다. 정서지능, 삶의 질, 학과적응 및 학과만족도 간에는 모두 유의미한 양의 상관관계가 있었다. 학과만족도에 영향을 미치는 요인은 학과적응, 삶의 질 정서지능으로 나타났고, 모형에의 설명력은 72.5% (F = 106.43, p < .001)를 보였다. 보건의료계열 학생의 학과만족도를 향상시키기 위해서는 학생 개인의 정서지능, 학과적응 그리고 삶의 질을 향상시킬 수 있는 전공영역별, 개인별 맞춤형 프로그램 개발이 요구된다. The purpose of this study was to describe emotional intelligence (EI), quality of life (QOL), major adaptation and major satisfaction of healthcare-related students, and to identify the factors affecting major satisfaction. The participants were 201 health care related students of A university in Busan city. The data were processed through t-test, ANOVA, Pearson correlation, and multiple regression analysis. The results has shown significant difference in QOL, major adaptation and major satisfaction at the factors of major, academic achievement and number of best friends in general characteristics. The major satisfaction showed positive correlation with EI, QOL and major adaptation which was statistically significant. The factors affecting major satisfaction were EI, QOL, and major adaptation. R² showed 72.5% (F = 106.43, p < .001) in major satisfaction. These results indicate a needs to develop intervention strategy promoting EI, QOL, and major adaptation of college students.